Black market for "Evening with AK and friends"! 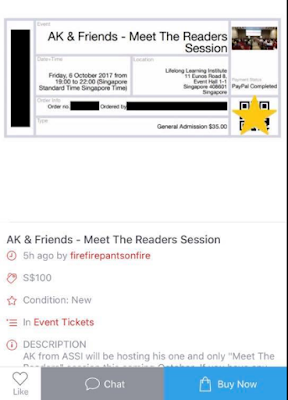 Although some readers suggested that reselling tickets to "Evening with AK and friends" could be a lucrative activity, I didn't take it seriously. A black market for "Evening with AK and friends"? I will tell you right now that "Evening with AK and friends" is not worth paying $100 a ticket for. Well, at least I don't think so. It irks me to think that black marketers are actually profiting from this when I am doing this for charity. $65 for the black marketer and $27 for charity (after costs)? There will always be another "Evening with AK and friends". So, say "NO" to black marketers. If you have bought tickets from black marketers, please tell me. I don't know if it is possible to find out but I want to know who they are. If you are a black marketer, I am appealing to you to stop doing what you are doing and return the tickets for a refund. Please. There are many readers who are genuinely interested in attending my event and they should not have to pay more than $35 a ticket for it. Regular readers know that ASSI is not about money, money and only money. It is also about decency and charity. Please help to spread the message and I hope that, in the end, decency prevails. We have tracked down the black marketer and will process a refund and void the ticket. Readers who are still interested in getting a ticket should check the ticketing site often in case some tickets are refunded. Do not pay more than $35 for a ticket. 1. Evening with AK and friends 2017. 2. 2018 Evening with AK and friends. It's awful that some people are trying to turn a quick profit out of your kindness and generosity :( it's disgraceful! hopefully readers will have the good sense to avoid! There will always be profiteers where there's money to be made. Just like bees attracted to honey. Maybe that'd why your tickets sold out within hours. I won't be surprised if resellers each bought many tickets for that purpose. I have to think of how to prevent something like this from happening in future or at least reduce such incidents in future. 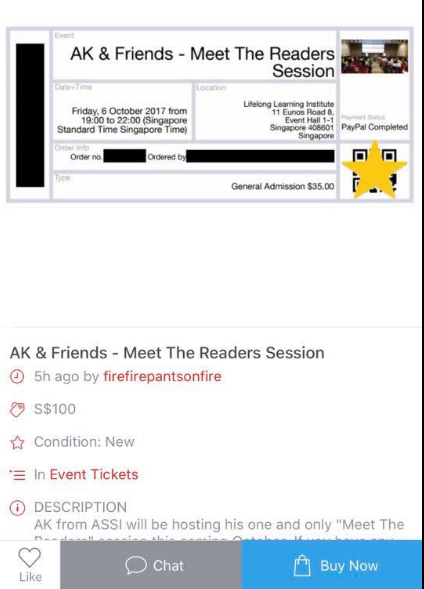 The easiest thing to do is not to have "Evening with AK and friends" again but that is not a good solution. Who knows, your tickets might even surpass the phenomenal rise of Bitcoin one day. All it takes is an orchestrated deluge of celebrity endorsements and "social media influencers" hyping it up to recreate the tulip mania. Lol. Just saying...if u can record your talks in a video and host it as an online course for pple to sign up...e.g. on Udemy. Yes, it has been suggested before but I have no inclination to conduct courses and I don't think I am good guru material. Of course, never say never. No one knows what the future holds. When I do meet up with readers, I enjoy the face to face interaction. So, even if I do offer a course in future, it probably won't be online. If I don't enjoy something, I won't do it. In retirement, I do something because I want to and not because I need to. Bad AK! Bad AK! This is an example of capitalism working without the state. Remember the Supreme "buy high sell higher" article? I am not savvy in such things. Kenji and Victor are the ones who tracked down the black marketer and they will probably think of how to prevent something like this from happening in future. Someone told me I should be flattered that there is a black market for the tickets. I am more disturbed than flattered, really. May I know the theme or topic for the coming talk you're giving. When I saw that you're giving a talk, knowing the tickets will be selling like hot cakes, without thinking,....fast fingers I got myself a ticket without a clue what you'll be touching on. "Evening with AK and friends" is a simple chit chat session. It is unstructured and what happens depends on what kind of questions the audience will ask. It is more of a social event. "For those who wana get refund, pls ask them do so by this week. Becuaee i will be overseas next week. "Once overseas, i wont be accessing my 'payment' portal for security purposes, fhus unable to do any refunds - until 23rd sep when i am back." Any chance to get last minute tickets? Any plans for a get together with your readers this year? Hope is happening soon. Quite a few readers have asked me about this. One could take place towards the end of the year. I know. AK is lazy! Bad AK! Bad AK! Evening with AK and friends 2018 SOLD OUT in less than 29 hours. "I sell on carousell $70 per ticket. 100% return!" Obviously he remembers what happened last year.